Hey, all! I received a sweet little package on Saturday and do you know what was inside? 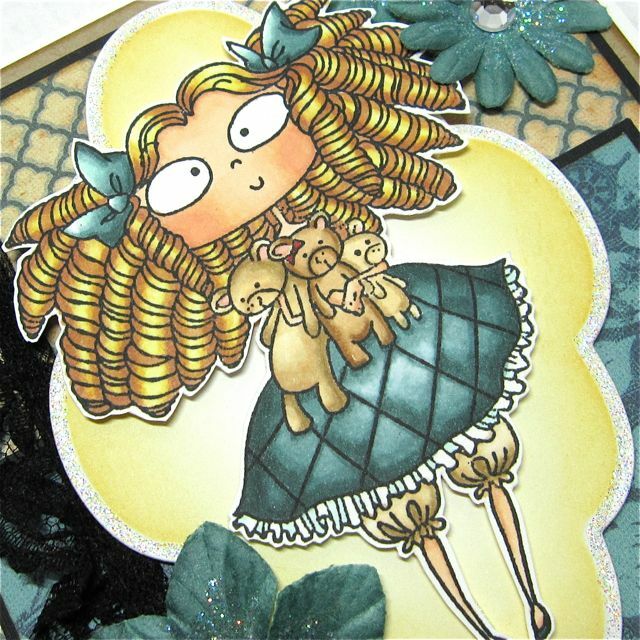 The new Halloween images from Kraftin' Kimmies and a few of the Fairytale ladies, too. This package was from Mom ;D She frequently sends me stamp care packages. I know...I'm a 43 year old, spoiled rotten brat. Ever buy unmounted stamps and let them sit around until they practically start growing moss before mounting them? I do that...A LOT! That was NOT the case with these puppies. They arrived Saturday afternoon and were mounted on cling about an hour after pulling them out of the mailbox...lol! I couldn't wait to get this beauty inked up. This is Goldilocks and she has some seriously radical hair, which was great fun to color. I just love her! Do you see my matchy, matchy flowers? I recently purchased a HUUUUGGGGEEE bag of white layering flowers by Petaloo, which was marked 50% off at Two Peas in a Bucket. They are awesome! I can take my Copics and make them any color I want, which means I will always have the right color of flowers on hand. Perfect! Of course, I am probably wasting a ton of ink, but it doesn't seem like it. Hi Cheryl, I can't keep up with you these day's. You really are in to it and have a lot of idea's. This one is great again. Oh I'm so jealous Cheryl,your day at the Copic certification sounds like it was heaps of fun!! Your card looks fantastic. I love her hair you have done an awesome job. OMGosh....I LOVE this card! The colors are just perfect and I NEED to have that black lace ;) I'm also jealous about your Copic Cert!! I really am "needing" some KK stamps, they are just too cute!!! Love, love, LOVE your blog! Glad I found and met you...such inspiration. Oh, showed my DH your blog and he loved your Kenny K's! Love these KK stamps! Haven't mounted mine yet, but going to get right on it... now that I've seen what you did with this adorable image! Can't wait to see your work with the Halloween images! This gorgeous. I also put in an order this week and can't wait to get mine!! I really love your coloring and what you did with Goldilocks, so cute. I assumed you were already certified as your coloring skills are off the chart! So glad you had a good time just the same! I just ordered myself some Kimmies...how lucky your mom sends you such fun gifts!! Beautiful card! I love the bit of black lace with it! Hi Chery! It was great meeting you this weekend! I was so impressed with your skills I had to come check out the blog. I also had to place my order for those fab Kenny Ks you showed me! Great card she is sooooo cute!! Seriously cute card!! 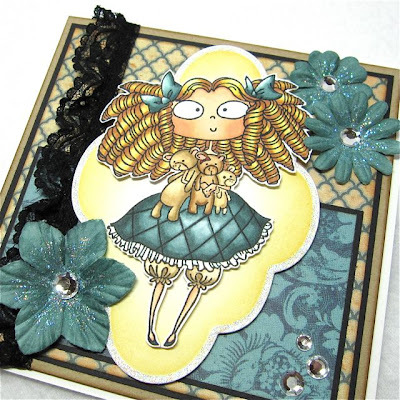 Love the black lace, and I'm jealous about the Copic Certification!! OMG! Super Mom!!LOL!! Love this Goldilocks image and you colored it wonderfully Cheryl!! Fabulous card!